"That's my secret, Cap. I'm always angry." Ian Wright can relate to that classic Bruce Banner line, the one uttered by the Marvel character as he's about to turn into the Hulk. Not because the former England striker is a superhero in the eyes of many Arsenal and Crystal Palace fans, but because, in his words, "for a large part of my life, I was angry. I was always angry". Wright is aware his story is traditionally told as one of those "never give up on your dreams" tales - not turning professional until he was 21, working as a labourer, spending a month in prison. In reality, the 55-year-old says his road to professional football was "11 years of failure", crying himself to sleep, getting into fights in Sunday League and trying to deal with his stepfather's cruelty. In an open and honest piece for The Players' Tribune, Wright explains how he wasn't born with that happy-go-lucky gold-toothed smile you see on Match of the Day on a Saturday night. He earned it the hard way. Wright was born in Woolwich, South London, before moving to a house share with his family in Brockley and then on to a home of their own. But Wright would spend as much time as he could kicking a tennis ball against a wall outside, in part to avoid being bullied by his stepbrother and, in particular, his stepfather. "He was a weed-smoking, gambling, coming-home-late kind of guy," said Wright. "I don't know why, but he didn't like me in particular." One of the things that got to football-mad Wright the most was being forced to stand and look the other way when Match of the Day came on. "My stepdad used to take that away from us," he added. "Just because he could. "Depending on what mood he was in, he'd come into the bedroom just before it started and he'd say, 'Turn around. Turn around to the wall'. "We had to face the wall the whole time Match of the Day was on. And the really cruel thing was that we could still hear everything. It was awful. I would cry myself to sleep whenever he did it." Wright says that stayed with him for years whenever the Match of the Day theme music would come on. "I'll be honest with you, it still gets to me every now and again," he added. "The first time I went on the show as a presenter, Des Lynam walked up to me and said, 'Ian Wright, welcome to Match of the Day'. "I nearly broke down crying. I told Des, 'This is my Graceland'." In his Players' Tribune piece, Wright talks about being rejected by Brighton after a six-week trial and almost blowing his chance at Crystal Palace, going to prison for not paying his driving fines and adopting Shaun Wright-Phillips after meeting his mother, Sharon, aged 19. 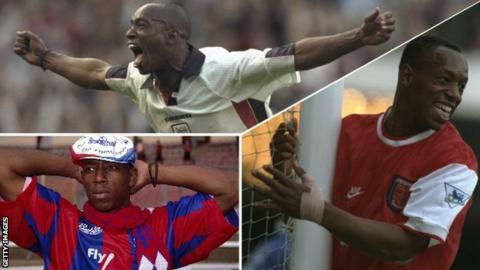 It was two years later the labourer got his professional break at Palace, despite turning the Eagles' first offer down, but when Wright scored twice after coming on as a substitute in the 1990 FA Cup final against Manchester United, it was the advice of former teacher Sydney Pigden that stuck in his mind. Wright says the teacher was "the one man in particular who helped me through those dark times" as a child who could barely read or write: "He changed my life." Mr Pigden taught him how to read and write, but also how to deal with his anger, how to have patience, be confident, communicate and take responsibility. "He was the first man who showed me any kind of love," said Wright. "When I played for England he called it the proudest moment of his life. Imagine that. This schoolteacher, who'd done stuff like been a pilot in the Second World War, who'd flown over Buckingham Palace… and he says his proudest moment was watching some kid who went to his school play football." Mr Pigden passed away last year at the age of 95. "He's still with me. He'll always be with me," said Wright. Now, as a father and a grandfather, Wright says he is "working on giving back" and wants to see football easily accessible to those who enjoy it, both on and off the pitch. "The truth is, I spent so much of my life angry and trying to catch up after a bad start," he added. "Maybe now that you've read my story, you'll see me on the television flashing a smile and you'll really understand that I wasn't born with it. I earned it."